The Byrd Campbell law firm provides services to businesses in Winter Park, Florida, as well as Orange, Osceola and Seminole counties. Having more than 30 years of experience behind us, we are dedicated to excellence in all areas of our practice, from the first meeting we have with our clients to the moment their issue is resolved. This includes trying to settle a dispute without the courts, but we always prepare for trial in the event this is not attainable. Handling cases involving real estate matters and commercial law, Byrd Campbell has built a reputation of success in assisting clients with their transactions. These include representing several developers, a national institutional lender, private equity funds and a hotelier who was selling and purchasing hotels. In trial cases, our law firm went up against a financial firm and obtained an arbitration award from the Financial Industry Regulatory Authority in the amount of $800,000, a multimillion-dollar verdict in a commercial fraud case from a jury and defended a client from allegations of a multimillion-dollar fraud scheme. Our law firm co-founder and partner, Tucker Harrison Byrd, has been listed as one of The Best Lawyers in America and holds the highest rating possible of AV Preeminent* from Martindale-Hubbell. Co-founder and partner, James S. Campbell, is certified by The Florida Bar Board of Legal Specialization and Education as a real estate attorney and serves on the board of directors for Covenant Care, which provides hospice services to veterans and others in the community. At Byrd Campbell, we pride ourselves on excellence. Whether handling a real estate development case in Boca Raton, Florida, or initiating litigation on behalf of a corporation, we continue to build on our history of success. Over the past 30 years, our law firm has amassed countless victories and positive outcomes for clients throughout Osceola, Seminole and Orange counties. For instance, in a bankruptcy fraud exception to discharge case, we obtained a judgment for our client of $800,000. In a multimillion-dollar dispute involving a closely held company, we successfully represented a minority shareholder who had been oppressed. While our law firm’s attorneys prove themselves in the courtroom and the negotiation room time and time again, they are dedicated to constantly improving their legal skills and knowledge. They are members of several legal organizations, including the American Bar Association and The Florida Bar. Our co-founder, Tucker Harrison Byrd, has received the highest rating possible of AV Preeminent* from Martindale-Hubbell and our other co-founder, James S. Camp bell, is certified by The Florida Bar Board of Legal Specialization and Education as a real estate attorney. Our law firm knows that behind a contract dispute or a property investment deal is a person with questions about how the law works and how their issue will impact them. From the first scheduled appointment, Byrd Campbell offers clients a personalized service. This may involve explaining elements of the Interstate Land Sales Full Disclosure Act, answering questions concerning a clause in a shareholder agreement or providing regular updates concerning clients’ cases. When businesses or real estate professionals encounter a legal problem, it is important to find the right solution. At Byrd Campbell, our law firm treats every case in Pensacola, Florida, with the individualized attention it requires. We know that clients have specific goals, challenges and needs that are influenced by their situation. Our team looks at the whole picture and explains to them what their next steps should be. We service clients throughout Seminole, Orange and Osceola counties. A successful outcome is often contingent on several factors such as legal skills, knowledge and an understanding of the other side. In commercial matters, our law firm knows that preparing for litigation from day one, and informing the other party of this intent, sends a strong message that we are serious about protecting our clients’ interest. In many cases, the other side often meets us halfway, thus eliminating the need for a courtroom battle. However, if they are not willing to negotiate with us, we are ready to take our case before a jury. Having more than 35 years of experience, our attorneys are well-versed in the laws that apply to their clients. 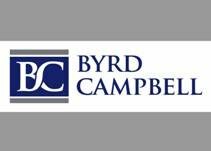 Byrd Campbell has handled a wide range of cases including financial fraud, contract breaches, shareholder disagreements, embezzlement, defense of foreclosure action, property acquisitions, intellectual property and capital structuring. Appointments are required for this law firm location.